It is believed that Jan Porcellis began his career as a graphic artist, not a painter, possibly in the employment of the Rotterdam engraver and publisher Jan van Doetechum who produced maps, book illustrations, and engravings of ships. Porcellis is first recorded as a painter in Antwerp, where he became a master in the Antwerp Guild of St. Luke in 1617. By 1622, he had moved to Haarlem. It is there that his work turned innovative, taking up the tonal style in his marines that Pieter de Molijn, Salomon van Ruysdael, and Jan van Goyen were developing in their landscapes. His known output is small; approximately 50 works have been identified. He was a leading influence on the Dutch marine painters of the mid-seventeenth century, in particular Simon de Vlieger, Jan van de Cappelle, and their followers. His paintings and drawings were collected by Van de Cappelle and Rembrandt. Paintings and drawings by the artist formed part of the permanent collections of the museums of Amsterdam, Antwerp, Basel, Berlin, Bordeaux, Braunschweig, Budapest, Frankfurt, London, Luxembourg, Munich, Paris, Philadelphia, St. Petersburg, and Stockholm among others. The elements upon which Porcellis’ fame rests are featured in this panel. The viewer is presented with a monochrome palette of light grey and brown that comprise sea and sky, accentuated by shimmering white highlights that delineate cresting waves and sunlight flickering through hazy clouds. Ships ride the middle distance racing over water marked by shadow and light. The smalschips were Dutch sprit-rigged transport vessels. 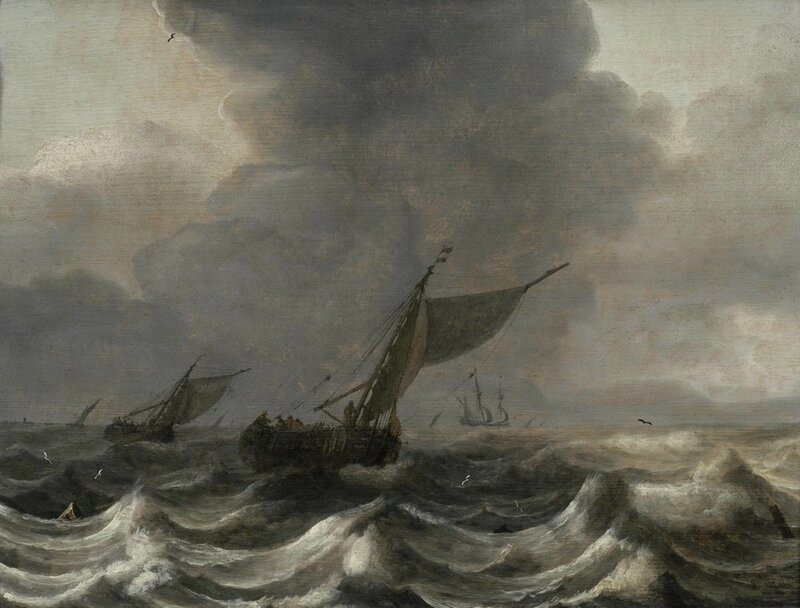 A strong wind blows from left to right, filling their sails and churning the waves. By such means Porcellis melded man, sea, and sky in a vivid recreation of the moisture-laden world of the North Sea. Margarita Russell, “Jan Porcellis” in From Rembrandt to Vermeer, The Grove Dictionary of Art, St. Martin’s Press, 2000, p. 251-252.